Armchair Bluejay: 5 games for Patrick Kaleta: does it set a precedent? 5 games for Patrick Kaleta: does it set a precedent? 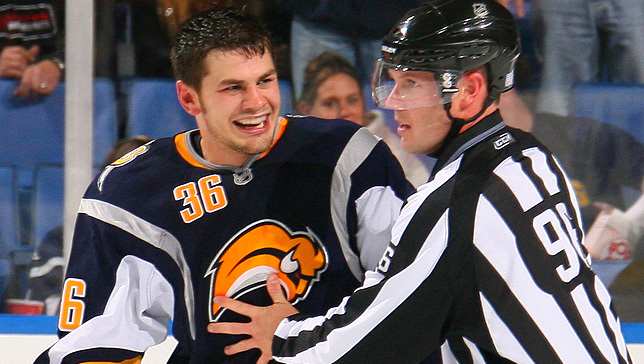 Patrick Kaleta's hit on Brad Richards earned him a 5-game suspension, as announced this afternoon by Brendan Shanahan. The NHL elected to carry out Kaleta's hearing over the phone, meaning 5 games was the maximum suspension that could be imposed. More serious suspensions can only be imposed in an in-person hearing. If the league does impose a suspension of six games or more, the new CBA will allow players the right of an appeal to a 'neutral arbitrator', whose "standard of review will be whether the League's finding of violation of the League Playing Rules and the penalty imposed were both supported by substantial evidence." It's not entirely clear what 'substantial evidence' will mean. Must suspensions be based on the precedents of other suspensions? For example, if another repeat offender makes the same hit tomorrow night, is the league forced to give him the same penalty? Or do they just need to show that they have some evidence? It's not clear from this whether arbitrators will have the mandate to show seference to the NHL's decisions, or whether they'll regularly pick apart the reasoning for the suspension imposed. This leaves open the question: what would be sufficient to warrant a 6-plus game suspension? The answer, clearly, would be a serious injury. Kaleta's history as a repeat offender (two-game suspension in 2009, a fine and a four-gamer in 2011), and the seriousness of the hit (Shanahan described it as being in an "extremely dangerous" position near the boards) both supported a serious suspension, and the NHL's tendency has been to rapidly escalate suspensions for repeat offenders. Now that the decision has been made to cap a hit like Kaleta's at five games, the league could face a test when hand out longer suspensions. If players can argue that other hits are no worse than Kaleta's (including, for example, a hit that results in a serious injury but comes from a first-time offender), imposing a longer suspension could prove impossible.